can we do multple shifts in order to get a stable carbocation or shift is allowed only once? Multiple shifts can occur. One classic example is the rearrangement that follows the cyclization of squalene oxide to lanosterol. Since a carbocation is planer the resulting stereocenter following reaction with a nucleophile would be racemic or an even mixture of (R) and (S) at the position of the carbocation. This can become more complex with the influence of additional stereochemical considerations from other portions of the molecule that don’t involve the cation or molecules with limited degrees of freedom. 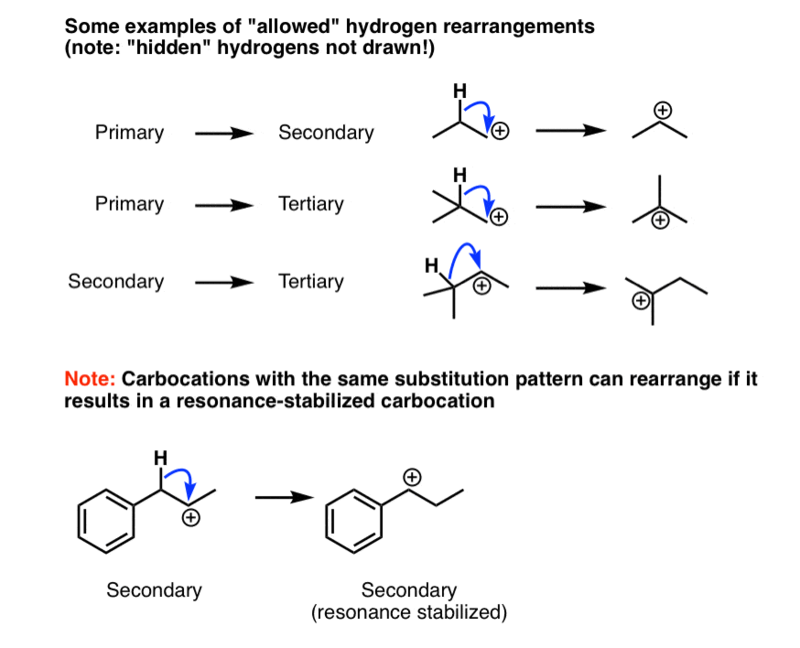 Benzyl carbo cation is always more stable than alkyl due to resonance .. So (Ph)-CH2+. Is more stable ….but at the same time remember that (Ph)+ is most unstable also.. The shift between 1 and 3 or 1 and 4 is prohibited becos for shift to take place the orbital overlap has to take place between the c-h and the empty orbital on C+. Which would be difficult with 3rd and 4th..
Not a problem, for our purpoases. H2PO4- is not that sterically hindered. Plus, you likely have other basic species swimming around such as solvents, counter-ions, etc. I personally in the lab was able to remove hydride from activated carbon at 1100C. The issue here with this PHD Chemist is the carbon originally was in a two electron covalent bond, Therefore removing a hydride leaves an electron on the carbon. 1 That means the carbon has 7 electrons. 2 Chemist are weird! They call this a carbocation. There is no way that exists as a free carbocation. The Br will form a 3-membered bromonium ion and will not be prone to rearrangement. In some cases – such as if you replaced the CH3 in your example with Ph – then the resulting carbocation would be quite stable, and it is during such situations that breakdown of the typically observed ‘anti’ selectivity for bromination is observed. Hydride before methyl. Phenyl is a bit of a special case because of anchimeric assistance. It can form a bridged intermediate. If I have 1-methyl cyclohexane carbocation ( positive charge on 3rd C of cyclohexane) , will there be a 1-4 or 1-3 hydride shift to furninsh a tertiary carbocation? I’m not sure from your description what the structure is. There will not be 1,4 or 1,3 hydride shifts as they are not allowed. However you could theoretically have a series of 1,2 hydride shifts that pass through a series of secondary carbocations and eventually settle on a tertiary carbocation as a thermodynamic sink. A carbon and hydrogen bond energy is around 413kJ/mol. Is it feasible for such hydride shifts to occur? Because I feel more energy is spent on breaking C-H bond than the energy released by making carbocation stable. 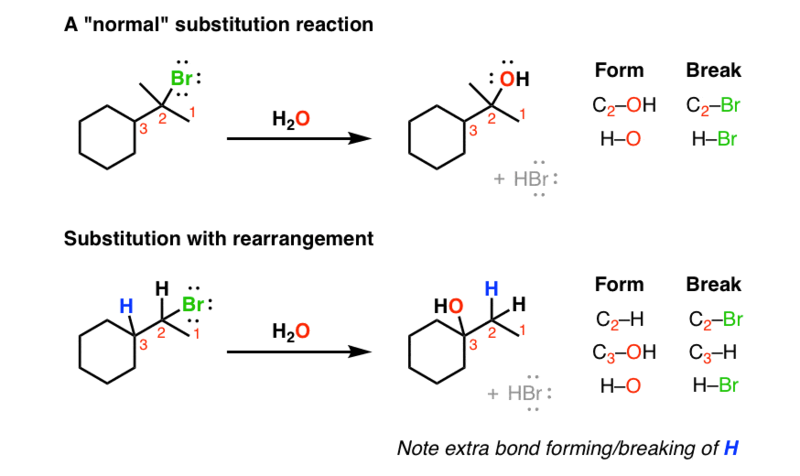 Secondly, how we could justify shifting of hydride from one molecule to other as in Meervein-pondroff-verley reaction? You have to balance out the energetic “cost” of breaking the bond with the energetic “gain” of forming a new bond. The bond strength of the C-H that’s being broken is usually within 10 kcal/mol of the bond strength of the C-H that’s being formed. There’s something wrong with your structure. 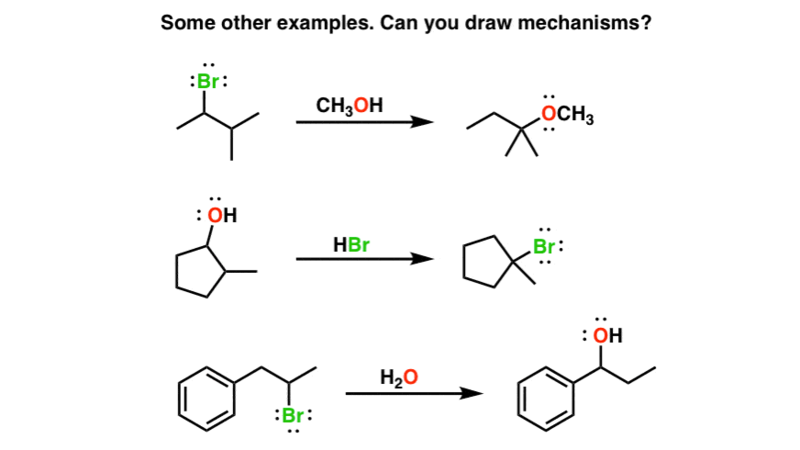 If we’re adding H-Br to an alkene and on both sides of the alkene carbons we have carbons that can potentially form more stable carbocations but one involves a methyl shift and the other involves a hydride shift, which pathway would we follow when doing the mechanism and adding the proton in the first step? All else being equal, hydrogen will migrate faster than anything else. 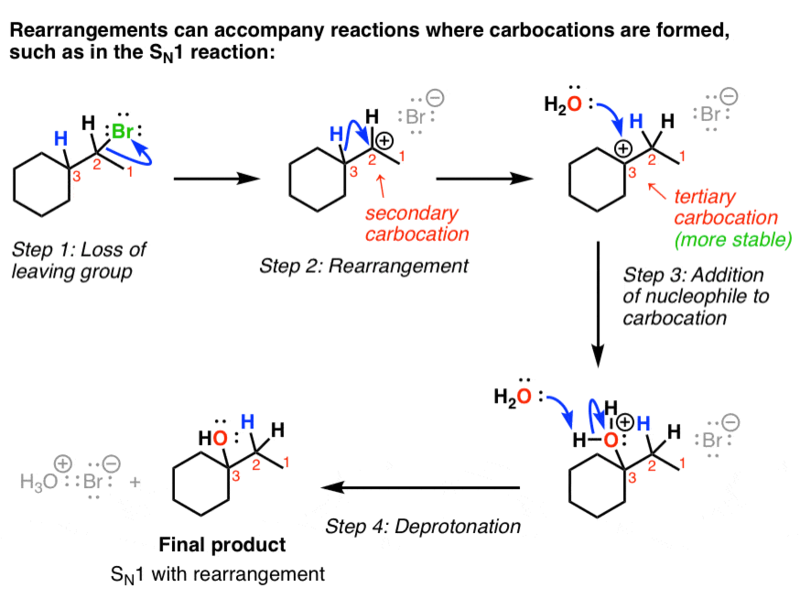 Can rearrangement occur within a tertiary carbocation…one tertiary carbocation to another tertiary carbocation.. Yes, but typically there has to be a driving force otherwise you’ll get a mixture of products. Can hydride shifts occur in a reaction of epoxide under acidic conditions? Yes, check out the Meinwald rearrangement of epoxides to aldehydes catalyzed by lewis acids.